When Honda unveiled the CB750 at the Tokyo Motor Show in 1968, it immediately captured the imagination of the motorcycling public. It would become the first mass-produced, large capacity, across the frame, O.H.C. four-cylinder motorcycle. And it also boasted another motorcycling first, a front disc brake. But just as importantly, it would be affordable for the general public to buy. The CB750 was a technological tour de force that set a new benchmark for the other manufacturers to match. When it hit the showroom floor a year later, it set a precedent in large capacity motorcycle design that has lasted to this day. 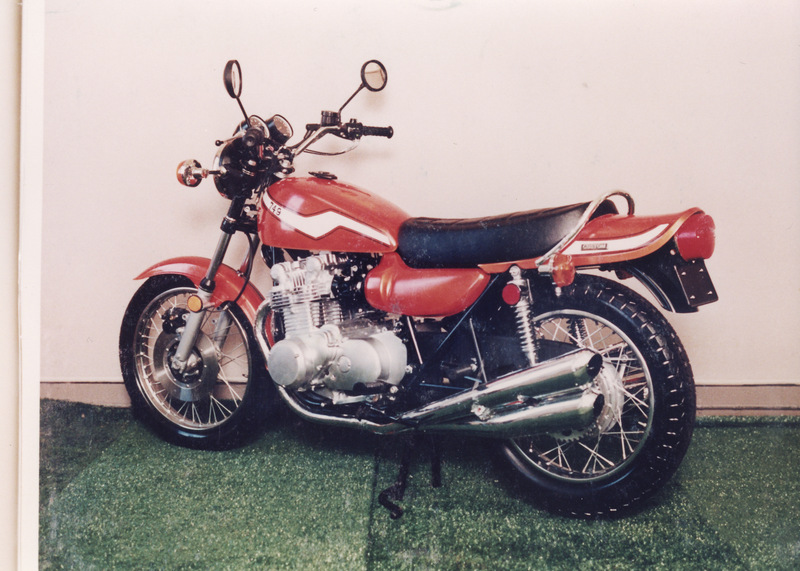 But if the Honda “four” captured the public’s imagination, then the Kawasaki Z1 super4 stole it. Conceived in 1967 after intensive research by Japanese-American Sam Tanegashima into the needs of the world’s most important motorcycle market, the United States, Kawasaki set its design parameters for a new large capacity motorcycle. Its heart was to be a compact D.O.H.C. 750cc four-cylinder engine that placed emphasis on lower exhaust emissions and running noise. The project had reached wooden mock-up stage by September of 1968 only to be still-born when Honda revealed the similar in concept CB750. But although this blow initially shelved the project, code-named “New York Steak”, it also proved useful to Kawasaki. They could now gauge market reaction to the big Honda, and in 1969 another intensive survey of the U.S. was undertaken. Later that year the final decision was made. The small team involved in the project, Mr Inamura and Mr Togashi, (chief engineers for the engine and chassis) and Mr Tada, (chief designer) were told “New York Steak” would go ahead. But Kawasaki’s re-evaluation had concluded that the engine capacity should be 900cc. This created a new niche in the large capacity motorcycle market, and Kawasaki would regain the mantle, formerly held by its W series 650cc twin, as the largest capacity motorcycle on offer from Japan. The real challenge for the engineering and design team, however, was to meet Kawasaki’s ultimatum to have the new bike ready for final testing within 24 months. Although a lot of groundwork had already been done, with over $800,000 invested in development costs for the 750cc version, the timetable was still a tough one. In the Japanese spring of 1970 the first prototype hit the demanding Yatabe test course, and in the hands of its American test rider lapped at an incredible average speed of 200kph. There were problems though, the crankcase breather system let oil out instead of keeping it in, and piston crowns succumbed to the intense heat of combustion. But the issues were rectified, and rewarded, with one prototype recording 95bhp and a top speed run of 225kph. In January 1972 pre-productions models were shipped to Los Angeles for testing on public roads. On a round trip to Daytona in Florida, they covered over 20,000km which included endurance testing on road race circuits. Apart from some minor chain and tyre problems, they proved the reliability of Kawasaki’s design. Not content with this, Kawasaki returned to the States three months later for more extensive tests. The results even surpassed Kawasaki’s own expectations. 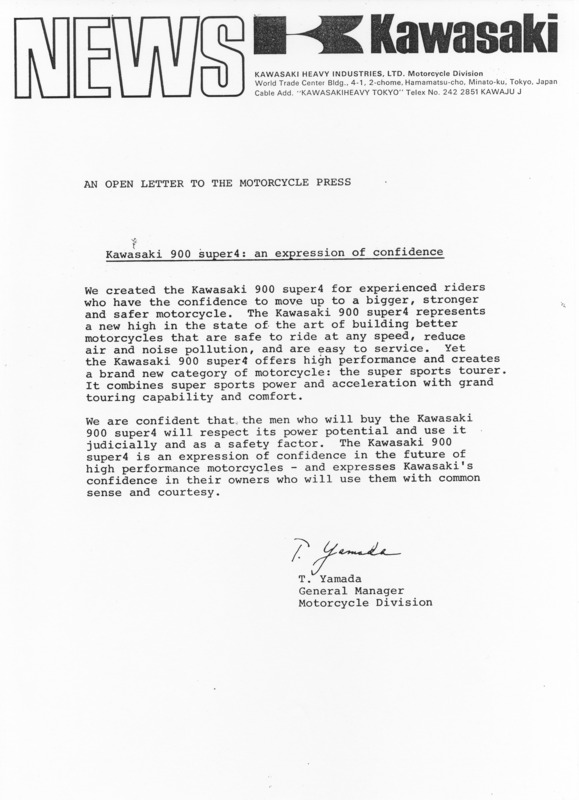 It was time to go public, and in June 1972 the worlds motorcycle press were invited to Japan by Kawasaki. The Z1 super4 was officially announced and opinions of the motorcycle, both good and bad, were eagerly sought – if Kawasaki were to beat Honda at their own game everything had to be right. By August the production lines were readied, now it was up to the marketing men. In September 1972 the Z1 was launched at the Cologne Motor Show while in Japan the production lines started to roll, building a conservative 1500 units per month. The Kawasaki design team held their collective breath while they waited to gauge market reaction to the new model. There was no need to worry, the Z1 super4 took the show by storm, as it did the other European shows that followed. By 1975 Kawasaki would be building 5000 units per month. It was the demands of the tough American market that had fathered the Z1, and something special was in store to underline the muscle-bound roadsters capabilities. In March 1973 a team of riders, mechanics and officials, arrived at Daytona Motor Speedway. Their aim, to set new speed and endurance records for a production motorcycle. Three days later they had established 46 F.I.M. and A.M.A. records including a new 24-hour record for a production motorcycle of 176.412km/h. Paul Cawthorne on the Bolton’s Kawasaki Z1. Later that year, at its first attempt, the Kawasaki Z1 came second, fourth and fifth in the gruelling Bol d’Or 24 hour endurance race, while in Australia, after an epic solo ride, Kenny Blake won the prestigious Castrol Six-Hour production race. The opening chapter of a legend had been written. “You can design the most beautiful motorcycle in the world, but if it doesn’t have the right engine, there’s no way you can make a complete package. Therefore, in all our bike development, the first consideration is the engine.” – Mr Inamura Chief Engineer Four-Stroke Engines, responsible for the Z1. 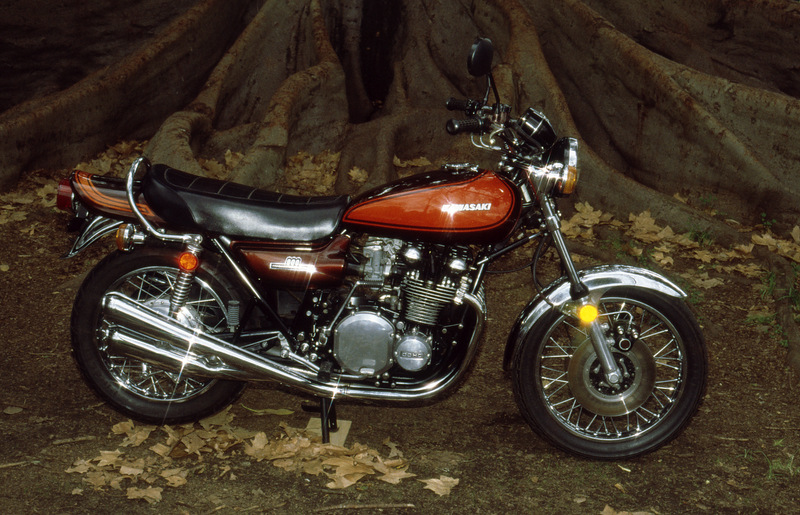 In the four years before the launch of the Z1, the Honda CB750 had established itself as the yardstick that other large capacity “sports tourers” were judged by. But although the contemporary Honda engine set the trend for an across-the-frame four, the technical specification between it and the Z1 was poles apart. 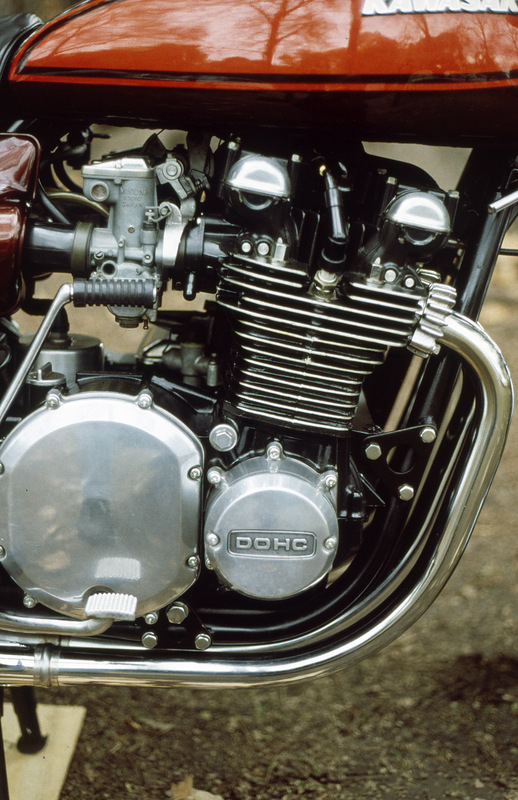 The CB750 boasted a single overhead camshaft with the valves actuated by rocker arms and adjusted by screw and lock nut. It had a bore and stroke of 61mm x 63mm with two-piece connecting rods that bolted together on a forged one-piece crankshaft which was supported by five plain main bearings. The primary drive was by dual sprockets and two single row chains, while the engine oil was supplied from a separate oil tank mounted under the frames side cover to a “dry” sump. It produced a maximum of 67bhp at 8,000rpm and 6.1kg-m of torque at 7,000rpm. The Z1, on the other hand, featured twin overhead camshafts that operated directly onto the valve via a “bucket” which used different thickness metal shims located on the top of it to adjust valve clearance. It had a “square” bore and stroke of 66mm x 66mm, while the crankshaft was a pressed up five-piece unit that allowed the use of one-piece connecting rods. The crankshaft was supported by six caged roller main bearings that required only low oil pressure to spin freely. The lubrication system was by wet sump, while the primary drive used a straight cut gear on the crankshaft web and turned directly on the clutch. 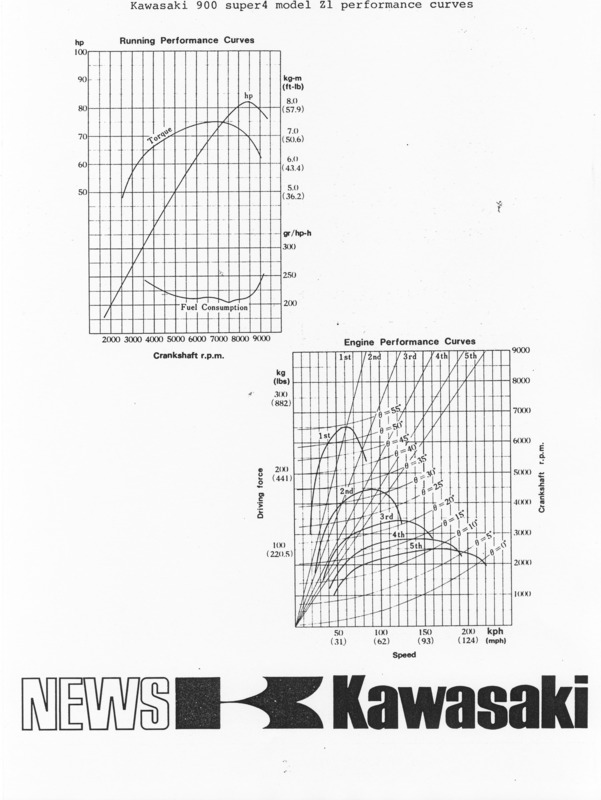 The Z1 produced a whopping 82bhp at 8,500rpm and 7.5kg-m at 7000rpm. It was also a very compact design – over 7.6cm narrower than the Honda. Both engines were sound designs and relatively under-stressed, and both responded well to tuning, but it was the D.O.H.C. design of the big Kawasaki that had the edge. During Kawasaki’s record-breaking blitz at Daytona, a stock Z1 with slightly modified camshafts and cylinder head, different carburettors and a four into one exhaust system, produced 105bhp at 10,500rpm. French Canadian road racer, Yvonne Du Hamel, used this bike (fitted with full fairing, race seat, clip-ons and slicks) to set a new closed course flying one lap record of 257.9km/h. Its top speed on the straight was 280km/h! But the outright performance was not the only consideration that had to be made by the engine team. The tightening pollution regulations in the US, particularly in California, required contemplation. Mr Inamura and his group took a leaf out of the auto industries book and came up with PCV, Positive Crankcase Ventilation. This was a means of recirculating “blow-by gasses”, mainly unburnt fuel that passes the piston rings and enters the crankcase. These gasses can contaminate engine oil and were usually vented by a crankcase breather into the atmosphere. The PVC valve allowed the gasses to be separated and vented from the crankcase back into the airbox to be re-burned, bringing about a claimed 40% reduction in hydrocarbon emissions. Another feature of the engine design was hardened valve seats and phosphor bronze valve guides, which allowed the Z1 to run on unleaded fuel. The valve guides, however, were found to wear rapidly enough for the factory to replace them in later models with iron items. The Z1 engine quickly became the favourite of performance tuners around the world and established itself as the engine to beat. From endurance racing to drag racing the Z1 engine proved almost unbreakable. Perhaps the greatest form of flattery is imitation, a compliment paid by Suzuki when it introduced its first large capacity multi-cylinder four-stroke street bike with the GS range that featured an engine configuration almost identical to the Z1. 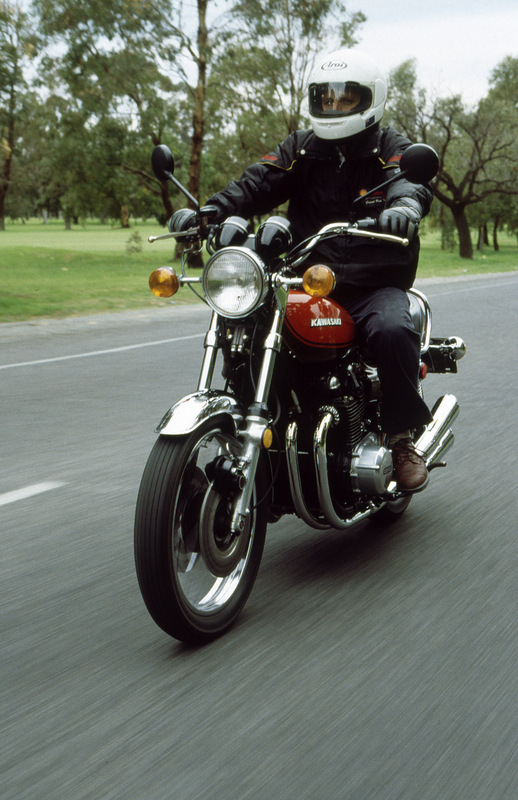 In the early seventies, Australia was in the grip of the worldwide boom in motorcycle sales. Two-wheeled transport became so popular that car dealers took on motorcycle franchises as a sideline to their passenger car sales. It was into this buoyant environment that Kawasaki launched its new “super4”, and with their first shot, they hit the bullseye. 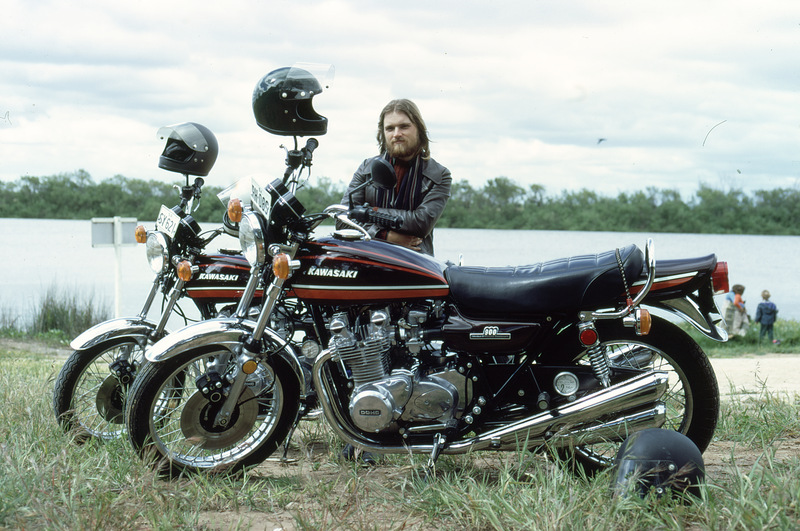 Author and his 1973 Z1A. Never had a motorcycle been more anticipated in Australia than the Z1. The American magazines were full of superlatives about the big new muscle bike before it arrived on Australian shores, and when it did, it received the same kind of acclaim from the local press. There were some reservations about the big Kawasaki’s handling under duress, but remember, this was the most powerful production motorcycle in the world! Not only could it cut the standing 400 metres in 12 seconds flat, but it had an amazing (for 1972) top speed of 217km/h. Bolton’s, the South Australian distributor for Kawasaki, displayed the Z1 in the window of its Greenhill Road showroom with a sign that was in keeping with factory publicity, and boldly stated, “for experienced riders only”. That sign did little to deter would-be purchasers, if anything, it just underlined the performance of the big Kawasaki. It should be remembered though, that in 1972 it was not unusual for Japanese motorcycles to have some “interesting” handling traits. 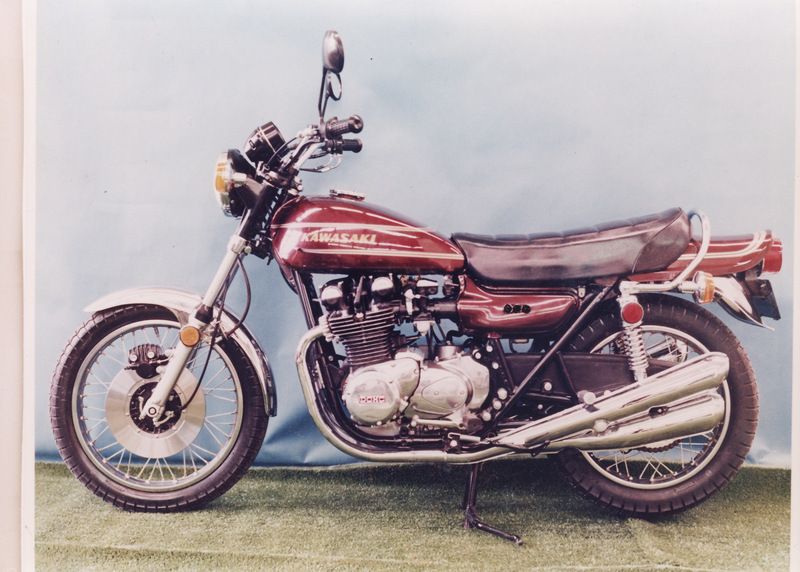 Most Oriental motorcycles were fitted with home brand tyres that quickly qualified for the title “rim protectors” as they were good for little else. Japanese suspension manufacturers had yet to master the art of effective compression and rebound damping, especially on the new breed of heavy big bore motorcycles coming from the land of the rising sun. The big Kawasaki exasperated problems with the chassis technology of the day, simply because it was heavy (209kg dry) and so powerful. It should be noted that even the European tyre manufacturers were not prepared for the Z1 and it soon started a race to produce more suitable rubber. English tyre manufacturer, Avon, was one of the first with their “Roadrunner” range and quickly developed a presence in production racing, which was by then dominated by the Z1. For the average owner to improve a Z1, it merely meant replacing the standard rubber for a set of Avon’s, trading the original shocks for some Koni’s, plus experimenting with different front fork oil. Fitting an adjustable Kawasaki steering damper also helped. All the above made an improvement and it was possible to use up more of the Kawasaki’s good ground clearance during a Sunday blast. But somewhere along the way, the Z1 would always remind you that it was still one big heavy motorcycle. Kawasaki’s publicity called the Z1 super4 a super sports tourer, and it was ably suited to that role. With two-up and luggage onboard the bike could eat up the miles effortlessly, with 4500rpm in top equating to 110km/h and returning around 6 litres per 100km fuel consumption. The Z1 did suffer some shortcomings – the standard handlebars were too high and wide, making the rider a wind sock at speed. At cruising speeds secondary engine vibration could be felt, although on its own it was not really a problem, but combined with the hard plastic hand-grips, it became hand numbing after a while. Also, the seat was too narrow at the front and a bit too firm over long distances. Another gripe was the front disk brake. It had a high content of the stainless steel, which prevented it from rusting – unfortunately when it rained and the brakes were applied nothing much happened! A makeshift solution was to drill holes in the disk which helped dissipate the water more quickly. It was a problem that sent Kawasaki on a search for better brake pad material and is responsible for the superior sintered metal pads we enjoy today. Twin disk brake was an option. General maintenance of the big Kawasaki was pretty straightforward and well within reach of the home mechanic. A relatively inexpensive special tool was required to allow shims to be changed for valve clearance, and a set of vacuum gauges made synchronising the carburettors easier. 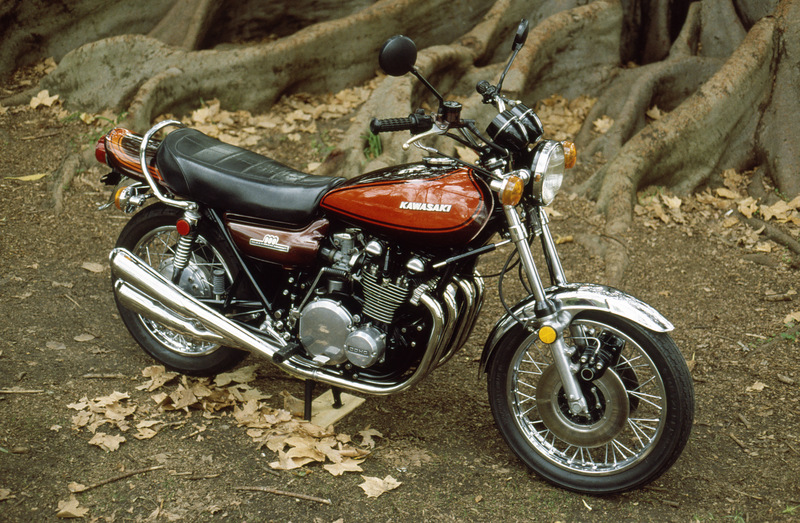 Unlike the CB750, Kawasaki had designed the Z1 so the cylinder head and barrels could be removed with the engine still in the frame, in fact, it was only in the rare occurrence of the crankshaft or gearbox needing attention that the engine had to be removed. Although the Z1 was fitted with the heaviest duty chain available (630), an adjustable automatic chain oiler was fitted to help extend its life. An oil tank under the left side cover fed a plunger type oil pump that ran off the gearbox output shaft and lubricated the chain from small holes above the gearbox sprocket. It was fitted to the Z1-Z1A before a lower maintenance Hatta o-ring chain became standard on the Z1B. The Z1 was a good looking machine, and it was interesting to read the policy notes of Mr Tada, chief designer of the Z1, as they sum up the appeal of the Kawasaki at the time. They read as follows ” a: a gallant and inspiring leader of Kawasaki’s street line, b: originality in styling, to be different to any other bike on the street (anti-Honda styling), c: a better look and higher quality than those of other competitive machines”. The Z1 had a majestic presence about it and some good detail design innovations. The faired automotive type mirrors were a first, and not only looked good but functioned well. The bullet-shaped gauges blended well with the overall styling and featured yet another first – a “dashboard” for the warning lights that also incorporated the ignition switch. Pretty hot stuff in 1972. 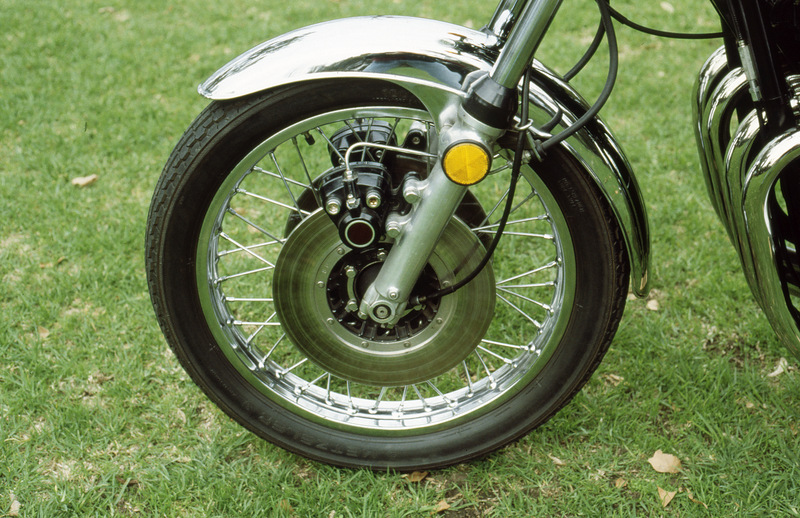 Also, the reflectors fitted to the front fork and rear shockers were not just for style – side on visibility of motorcycles at night was of some concern in the United States, so reflectors were a practical response. 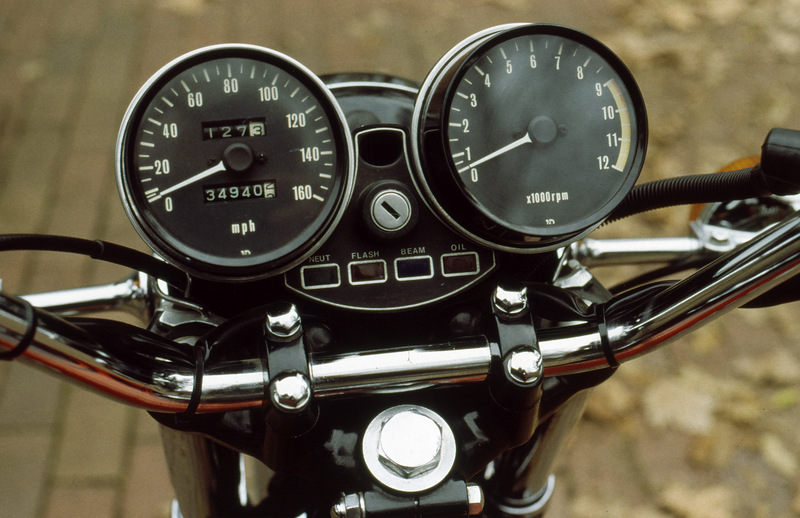 The Z1 incorporated a first in having the ignition and “idiot lights” between the gauges. It may be hard to imagine now, with all the Japanese manufacturers offering ballistic big bore models as front-line weapons in the battle for street bike supremacy, but from the Z1 of 1972, through to Z900 of 1976, the Kawasaki reigned supreme as the all-round performance King of production motorcycles. In 1967 when Japanese-American Sam Tanegashima researched the kind of large capacity motorcycle that Americans would buy, he envisioned a super cruiser, a machine that was equally at home in city traffic, or cruising lazily down country roads, to running flat out on America’s superhighways. A motorcycle that could stand proudly alongside the legendary Vincent HRD of yesteryear. From those of us that owned a Z1, Sam, you got it right. This entry was posted in Motorcycling and tagged Castrol Six-Hour, Honda, Kawasaki, Kawasaki Z1 Super 4, Tokyo Motor Show, United States on 06/08/2013 by Geoff Dawes.